EPE Foam,Bubble Wrap,Corrugated Cardboard Box,Etc. Customized is available to fit to unique using circumstances and requirements under the max size,we can change the design according to your needs to meet you requiry. 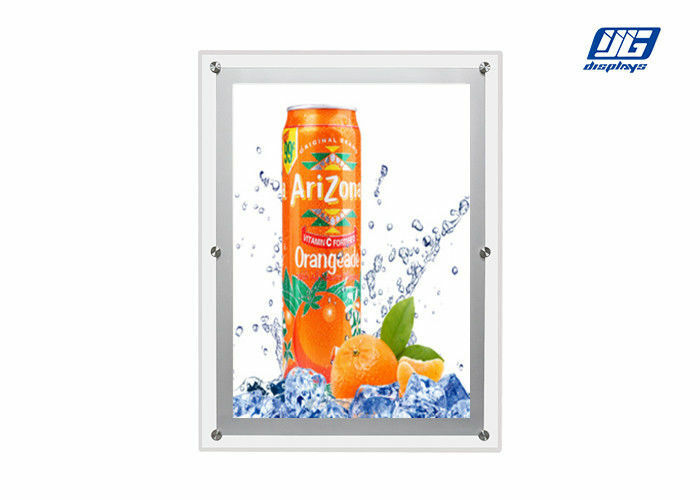 ① High quality clear acrylic frame to improve the lighting effect and provide a better visual feeling. ② Light source:2835 SMD LED with 50000 hours life span and LM80 listed, energy-efficient, low heat generation. Low power consumption, energy-saving(up to 70% compared with normal light), high illumination and environment friendly. ③ Poster can be hold between the two acrylic boards to avoid slide. ④ Unique screws design can provide a stable assembly when the products being installed on the wall or other place,meawhile this design has a better visual effect to improve the whole viewing feeling. ⑤ White color LED or RGB LEDs to be chose for variety display,customized available to meet all kinds of specific needs from customs.The light source also can be adjusted. ⑥ Main design for wall mounting installation style,and protrait or landscape is ok.
⑦ External power supply with CE or UL certificaiton. ① The CRS Super Slim Crystal Frame for A2 Size LED Advertising Light Box can be packed with corrugated box or honeycomb box according to different shipping needs.If there is specific requiry about the packing such as wooden case,we also can design for the packing according to your requiry. ② EPE foam corner protectors,bubble wrap and cardboard sheeting can be used to provide products a well protection. ③ Poly bag can be used to protect products from dust. We can deliver the products you ordered by the all kinds of express or air freight,if there is a substantial order,we may load a container and ship it to you.If you have specific needs about the shipment of the products, you can tell us.